If yesterday was a challenging day, today was a joyous day. Things went much more smoothly and no paint got on my face. Here is a studio painting, and Day 4 of the challenge, made from my plein air efforts of yesterday. What made the day joyous was how smoothly this painting went and the fact that I am seeing some subtle progress in my work. I took the day off from plein air painting today so I only had one painting to make. I had a chance to get the previous paintings posted for sale on my DailyPaintworks site. I also got them up on my website! I cleaned my studio a bit and painted. I am also finished before 9 pm which is a relief. 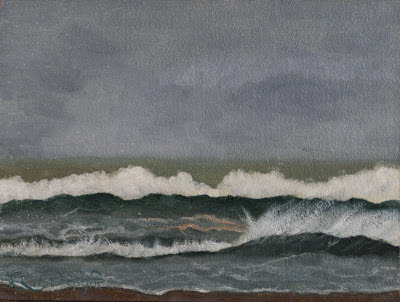 I will be taking at least one more day off from the plein air painting of the wave studies and then will jump back in whether or not the new canvas has arrived. I made a surprising discovery. I have become terribly addicted to plein air painting! I am eager to get back out and paint more wave studies. I think part of it is my skills and understanding are growing leaps and bounds with each excursion. That makes me hungry for more. This is a short post today as I need to get a few more things done before getting to bed. Oh, did you notice the red tide? It really was that garish looking and only in that section of the waves. I would see it flash at me when the swells would lift it into sight.